As part of the teaching process with Masters students in University College Cork’s Digital Arts and Humanities Programme I have been exploring the world of infographics and their potential to communicate information in an attractive and easy to digest manner. For those of us without substantial graphic design or software skills there are a number of sites which attempt to facilitate the creation of infographics based on pre-existing templates. One such site is Easel.ly, which formed part of a tutorial delivered by Paul O’Shea and I earlier this week. In preparation for this I decided last weekend to experiment with Easel.ly, with specific reference to communicating information regarding Irish participation in the American Civil War. I am a fan of using visuals to communicate historic information and there have been some previous posts that have explored this, such as Scarred Men: The Disfigurements of New York Irishmen, 1863 and Visualising the Demographics of Death: 82 Men of the 9th Massachusetts. My easel.ly effort is somewhat basic and could do with honing, but I wanted to take a handful of the facts and figures regarding Irish involvement and put them in a format that might draw attention to the sheer scale of the war’s impact on the Irish diaspora, something that in particular needs to be better understood and examined in Ireland. Despite its crude nature I felt that as I had created it for the class, I may as well share it on the blog! Interesting Damian. I’ve done a bunch of single stat infographics, but this goes well beyond them. I’m going to try to develop one while my series is on Christmas hiatus. Do you mind if I share yours on my facebook page (with attribution). I like infographics a lot and if used in the right way can be a great tool. Please do share it, the more the merrier :-)! Great infographic. 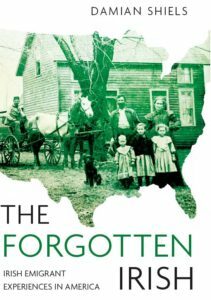 I’m doing a research paper (BA History Undergraduate) on the Irish Involvement in the American Civil war, and would love to use your information. Do you happen to have the sources for such information handy? Many thanks for the comment, I am glad you found the infographic of use. There are significant amounts on the site here that would help, from the resources section through to the individual blog posts (where you will find many of the sources for the original pieces of information in the infographic), so please feel free to explore and to cite as relevant. You should also be able to cite this site as a source for the infographic generally. 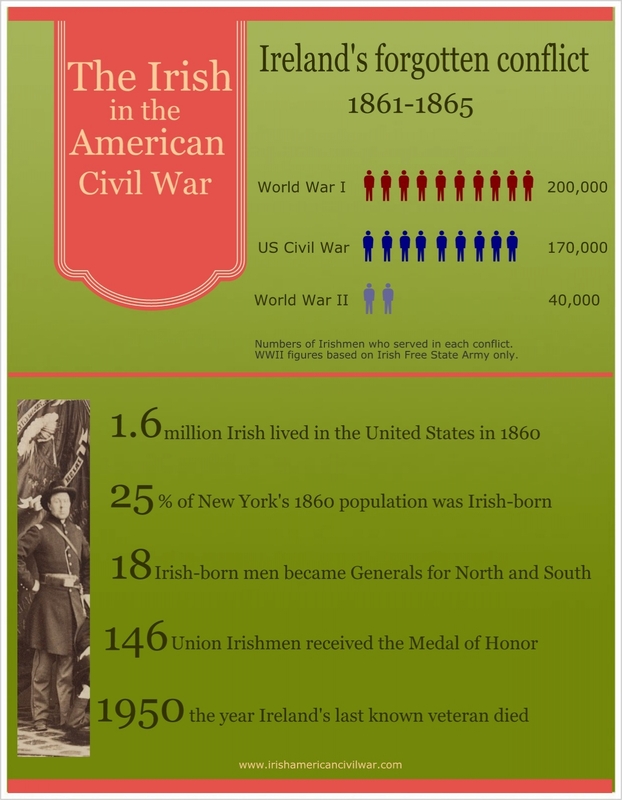 All of the information in the infographic is also contained within my book on the Irish in the American Civil War.